Luke, third son of Montana's wealthy McCutcheon family, is different from his brothers. As the offspring of a Cheyenne warrior, he carries a chip on his shoulder for all to see. His flashing eyes and handsome face make Faith feel she's stepped into some long-ago tale where men cherish their women--and keep them safe. If only she could trust him! Faith is on the run, and although she's pampered and protected by Luke and his family, she just can't risk the consequences of sharing the details of her past--one that's hunting to take her back to the nightmare she's just escaped. Happy-ever-afters are for fairytales, she reminds herself sternly as her heart feels the warm pull of his. 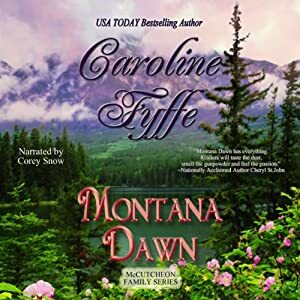 Still, she can't help but dream of a loving family, a home to call her own, a beautiful and bright...Montana Dawn. I got caught up in this story very quickly and I could listen to it quite happily for quite a lengthy period of time. My favourite scenes were the circumstances surrounding how Luke and Faith meet, when the characters are on the cattle run and when Luke goes off on his own to discover the truth behind Faith's situation. There were periods however, where not much happens. I got a bit impatient when Faith was staying at the McCutcheon's ranch as not a lot new happened. Ward was fairly quiet in the intimidation front and Faith was frustrating in her inability to confide in Luke despite the numerous opportunities he gave her. I listened to the audio version of this book and I thoroughly enjoyed it. I would definitely check in with the McCutcheon clan again. There is a whole series ready to be enjoyed! I would also jump at the chance to listen to books narrated by Corey M. Snow as it would be professionally produced, sound fantastic and the characters really come to life. Corey M. Snow did an amazing job with the narration. I'm glad a male voice was chosen as Luke's character really stood out for me as the most likeable. There were a lot of male characters in this novel and the narrator made them individually come to life in a realistic way. They all sounded exactly as I would imagine cowboys to sound. The narrator was excellent at completely changing his tone of voice for the female characters as well. Very well done. I was gifted this audio book from the author via audiobookblast.com in exchange for an unbiased review.